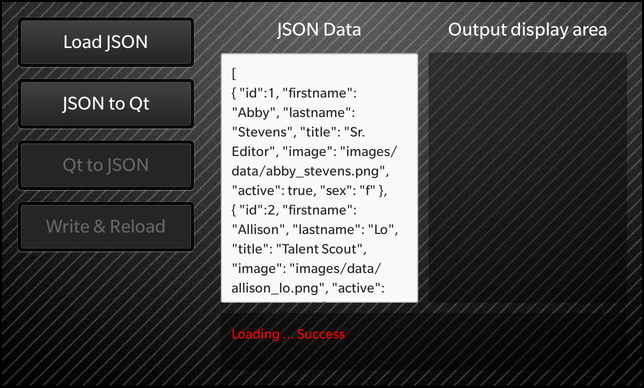 The JSON Read and Write example shows how to use the JsonDataAccess class from the libbbdata library to convert between JSON formatted data and standard Qt value types. The topmost (root) JSON element must be either an array or an object. See http://www.json.org/ for the JSON format description. The example progresses through four steps (with four corresponding buttons). Another variation is to manually edit the JSON data in the left-hand list (perhaps to introduce errors) and then observe the error message in the status line after pressing [JSON to Qt]. Copyright 2012 Research In Motion Limited. This document may be used under the terms of the GNU Free Documentation License version 1.3 as published by the Free Software Foundation.